Bill Scott was a respected Scottish sculptor who established and developed his practice in Edinburgh, while creating work for public spaces and exhibiting nationally and internationally. Working predominantly in bronze and wood, his work explores our human experience, particularly how we inhabit, use and define space – experiences he saw influenced by changes in society, science and art. While his early work evidenced influences from Brâncuși to Giacometti, his work was in turn influential to the work and careers of many of his students and peers. In parallel with his practice, he was a valued and dedicated teacher and mentor as a lecturer, as Head of School of Sculpture and latterly as the first Professor of Sculpture at Edinburgh College of Art (ECA). He was known to be generous with his time, encouraging his students in their practice and careers. He enabled opportunities for rigorous discourse and artistic exchange to broaden students’ perspectives, challenge received ideas and to give them the confidence to be ambitious. 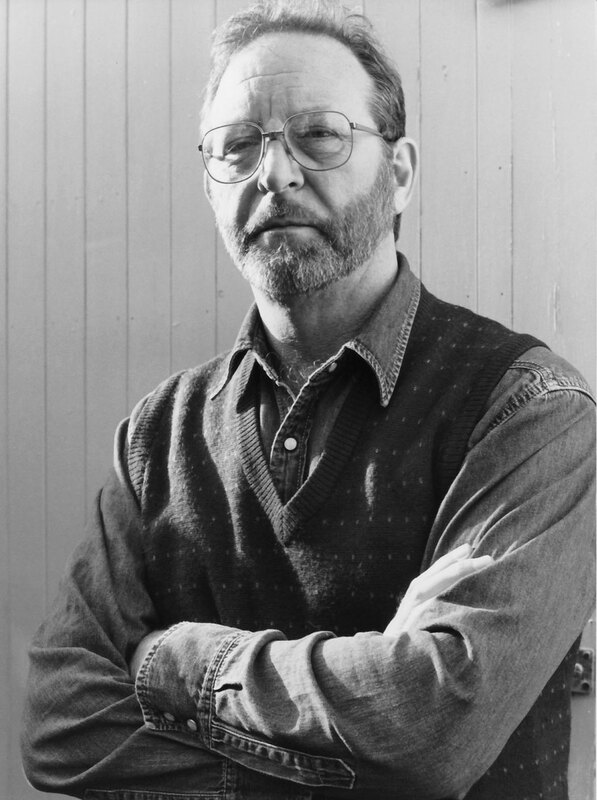 Over a fifty-year career Bill was a key influencer in the wider cultural landscape, serving on many government and institutional committees and boards to support the visual arts in Scotland and elsewhere. Two institutions of great importance to Bill were the Royal Scottish Academy (RSA) and the Edinburgh Sculpture Workshop (ESW). He served two terms as Secretary of the RSA and then a further two as the first sculptor to be elected President. As Chairman of the ESW, he was a tireless supporter, campaigner and fundraiser for new buildings that would offer world-class facilities for local sculptors and visiting artists. His fundamental vision in these organisations was for a vibrant and stimulating visual arts sector that especially encouraged international relationships, as he had previously done at ECA. In 2011 he was awarded an Honorary Fellowship of Edinburgh College of Art in recognition of his work as a practicing sculptor and as a tireless supporter of the visual arts in Scotland. A number of my recent sculptures and drawings have been given the title Measuring Personal Space. This designation has been chosen to represent a series of related terms which I feel are of great significance in our time. These include the often stated need for ‘personal space,’ the more contemporary notion of the ‘comfort zone,’ the desire to become clear of other people, to be able to free oneself from social and professional ties, at least for a moment, and to achieve in so doing some ‘quiet time.’ These common phrases efficiently indicate the complex issues which arise from a consideration of the individual’s place in the world and the, necessarily fragile, balance one must achieve between the public and the private spheres. Within the notion of private property there is a clear and definable space, which is shaped by, and understood as, our immediate environment. This space is easily measured by the standard tools. However, this same space, despite its clearly defined boundaries, is used in an entirely personal manner by each of us, a manner which is not susceptible to determination by the metre rule, the kilogram and the second. How we might feel comfortable within these solid limits is purely a question of individual temperament and choice and these lie far beyond the reach of the accepted standards of measurement. One must search for an understanding of such things using quite different tools and thought processes. These tools must themselves first be designed and constructed. The thought processes will be inseparable from this activity. One of the many curiosities within this arena of activity is that, from time to time at least, that public space also seems to belong to us and is defined by us to an extent, whether these public spaces be in the landscape or in the city. Although we do not own this type of space, and it may lack the clearly defined and certain limits of our living spaces, we know that it, too, is ours; we are in the process of creating it and defining it as we move through it. Public space necessarily has some thing in common with private space. We are the common factor. this complex and typical human experience. The first of these is to make structures which may equate to living rooms and to other domestic environments. Here the built structure itself is a form, often geometric in character, which then becomes a support, as the walls and floors, for smaller forms and for the images and objects which inhabit our personal space. These small scale works, concerned with interior and exterior spaces and viewed in my work from the outside, are abstracted; they are not necessarily limited to specific locales as would be the case in our ‘real’ world. They are theoretical in character. Bronze is appropriate to these works, partly because it offers the opportunity to make statements which, to some extent, relate to the classical tradition and are, therefore, a part of that historical continuum. Bronze also provides the necessary distance from the world. of the world and the wall pieces occupying a spatial plane associated ideas, creative thought and the imagination. Here the matériel of the quotidian life, and the effects of its presence upon us, may be examined more closely. These wood sculptures are marked with painted forms and have texts inscribed upon their surfaces; they are complexes in which an immediacy is paramount. They are concrete in character. Wood is exactly the material which connects them to the world. Each approach attempts to unfold the interlocking spheres of the public and private and to determine why, and how, one might take precedence over the other at various times as we move through them. The type of ‘measurement’ required here is philosophical in character. Metaphorical tools for these speculative activities have been produced in order to examine the place of private thought in the midst of a very public world. These are the sculptures. Traditionally, sculpture enters space; it rises up into it or stretches out, through it and across. 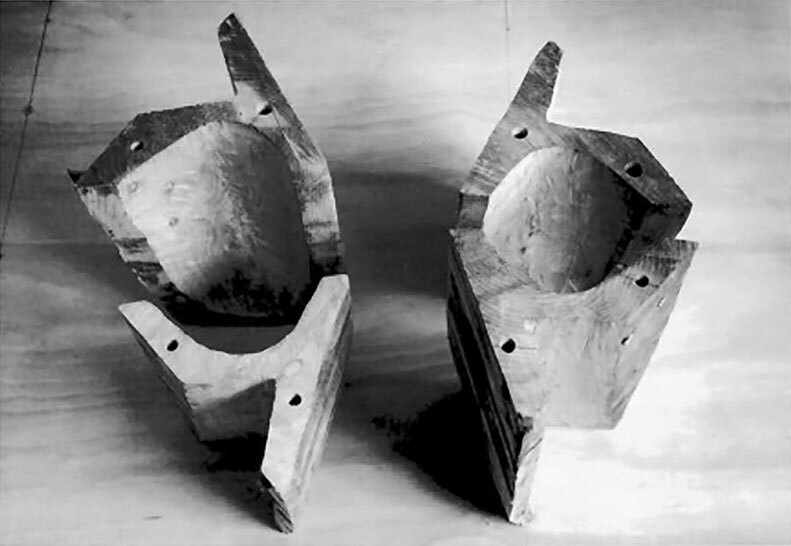 Bill Scott’s recent work in wood places sculpture in air, in the midst of the second element. When a tree is cut down, that is to say when it is turned down from being in the air to lying on the earth, the water, which has always been present in the wood, suddenly becomes a problem; as the wood dries out it can crack and break, uncontrollably. The tree, or the large block of wood cue from the tree, must be split open in order to allow it to dry out, to allow the air to get in at the wood. Scott exploits the necessity of this in his work for both its technical and sculptural imperatives. In recent years the artist has preferred to use newly felled timber, which is, of course, especially liable to cracking. He selects a section of the tree, cuts it in half and takes the heartwood out of it quickly with a chain saw. The air circulates and the wood is able to stabilise. As the wood is allowed to breathe, so it is allowed to stand. The two are intimately related; inspiration is recognised as independence. The work’s life in the air has to do with its presence before us. 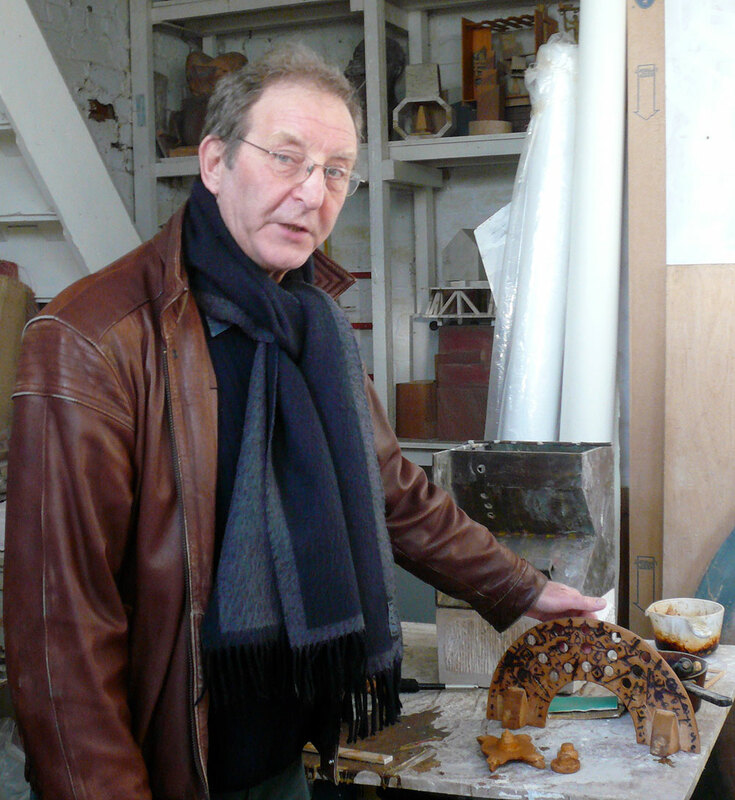 Bill Scott is the first sculptor in the long history of the Royal Scottish Academy to have been elected President. As the Friends approach their 25th anniversary year it is appropriate to examine not only Bill’s work, but also his long involvement in the domain of sculpture and the myriad activities associated with it. Bill was brought up in Moniaive, Dumfriesshire. He studied at Edinburgh College of Art from 1953 to 1959 and then at the École de Beaux-Arts in Paris for a year before returning to Scotland to take up stone-carving commissions, including working at Iona Abbey, and to teach at the College. His early work emerged from the milieu of the folk music and vibrant conversations which surrounded him in the ‘poets’ pubs’ of Edinburgh and the cafés of the Parisian boulevards and, perhaps inevitably, the human figure and its immediate surroundings became the focus at that time. the wider social and political implications for the country were also addressed. More recently the work has concerned the individual’s attempts to assess the world, to measure it, to consider it from both an immediate, physical, point of view and in a more philosophical sense. As a result the artist has produced metaphorical ‘tools’ for these speculative activities, arrays of small object-sculptures coming together to indicate private thought in the midst of a very public world. Bill has exhibited throughout the United Kingdom, Ireland, Europe, North America and Japan. He has in particular been associated with a number of public sculpture commissions in Scotland, including a complex monument commemorating Sir Alex Douglas-Home at The Hirsel, Berwickshire, and a sculpture of Elizabeth Crichton at Crichton University and College Campus, Dumfries. In 2011 Bill will be showing at the Royal British Society of Sculptors in London, Inspace at the University of Edinburgh and at Haus Hohenbusch, Erkelenz, Germany. of the Sculpture School, and became Professor of Sculpture. There he was particularly concerned with developing the course for postgraduate students and preparing them to enter professional life. It is therefore appropriate that he has, since retirement, served as the Chairman of the Board of the Edinburgh Sculpture Workshop, which has now secured funding for a £4.5 million new building and recently won the prestigious Scottish Community Foundation’s Arts Funding Prize of £3 million for an inspiring new multi-disciplinary arts space, the Creative Laboratories building. Bill has also served on the Board of the Fruitmarket Gallery, Scottish Arts Council committees, The British School at Rome and elsewhere. He has had a long-standing relationship with the Academy and has recently been elected President for a second three-year term.